Pipelines and Strawmen – UPDATED! Posted on November 30, 2014 February 6, 2015 . by Patrick Johnstone. Leave a comment. Sorry to be out of touch, I’m still on the steep part of the learning curve, and have a variety of tasks to get done, while trying to recover from one of the busier months of my life. All good stuff, just time consuming. Also still working on the post-got-elected plan a far as social media, and will have that worked out by the new year. Until then, I will still be writing occasional rants here as things bug me enough that I stay up late writing about them. Like this one. In rhetoric, there is an argument technique called “the strawman”. This is a logical fallacy where one reduces one’s opponents’ argument to a single ridiculously simple argument, then beats that argument to death. This is meant to make it appear that you have beaten your opponent’s actual argument, which might not be so weak. Except you are not beating your opponent, you are beating a weak and easily defeated parody of them; hence “strawman”. There are a myriad of examples of this technique; if you at all pay attention to modern media-driven politics, it is hard to go through a day without hearing someone beating down the strawman version of their opposition. Unfortunately, the dumbing down of journalism, driven by the one-two punch of cost reduction (so fewer traditional media can afford to pay highly skilled professional journalists to do a proper job) and social media dominance (where the narrative is often reduced to a compelling photo and 140-character missives) only serve to push strawmen to the front of the argument. It is much easier and cheaper to push forward the extremists and their strawman arguments and feed the conflict that attracts eyeballs than it is to tell the full complex story of conflict that underlies so much of today’s political landscape. As a consumer of media, and a person interested in politics as a solution to conflict, I find it useful as a first step to determine if the rhetoric you are hearing is an extreme position. All political arguments have extreme positions, and rarely (never?) is the solution found at those extremes. However, it is important to understand where those extremes are, if only so one can work their way between them, and see where in the vast field of grey between the black and white the solutions may be found. 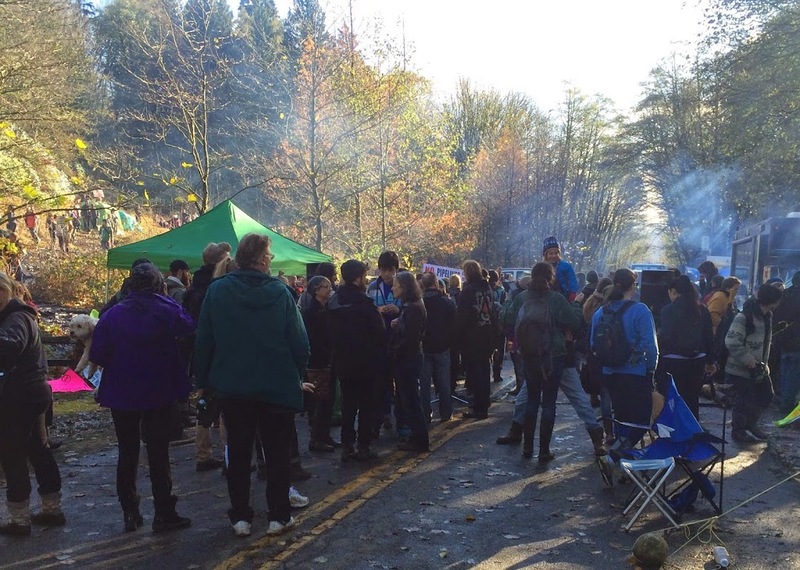 So I went to Burnaby Mountain last week.I talked to people standing at the line, demonstrating their concern about the introduction of a crude oil pipeline to the Burnaby Mountain Conservation Area. I talked to one person I know well, who was arrested a few days previously for crossing the arbitrary court-ordered “line”, because (and I am paraphrasing based on previous discussions I have had with him) he feels that it is his moral imperative to protect his children’s future by taking whatever action he can to slow anthropogenic climate change. I also talked to a few other people of varying walks of life who showed up, some to see what was going on, some who were opposed to this project in particular, and some who had wider-ranging opposition to the political direction of the country, with this project being a local manifestation of this. There was a lot of variety of ideas in that crowd. 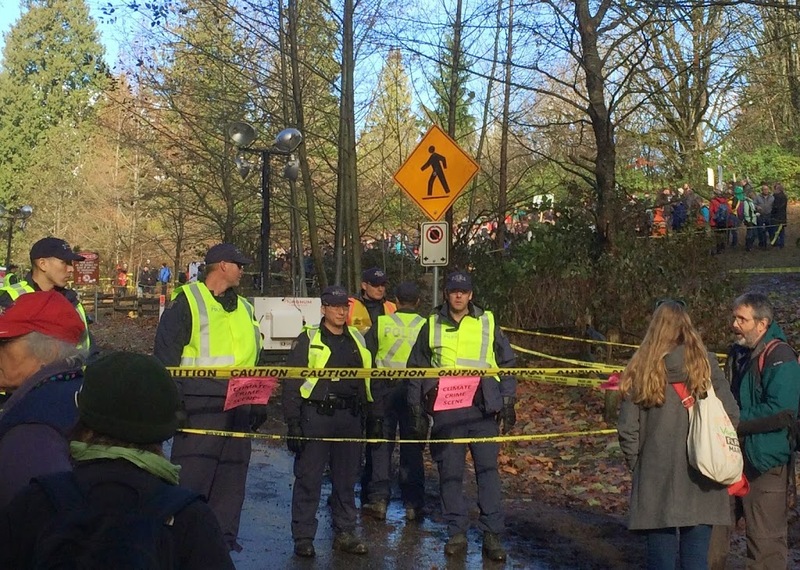 (disclosure: I actually know the scientists overseeing this drilling investigation on Burnaby Mountain from my time at SFU; we worked together, and I consider them friends, so I effectively knew people on both sides of the police tape!). I found that visit more informative than reading the silly extreme arguments you might normally be exposed to by “responsible journalists” like those at the Vancouver Sun or Black Press. So I thought, just for fun, I could outline strawmen being deployed in the biggest political story in British Columbia right now, one from each side of the debate, so we can be clear on what the “extreme” position is, and waste less time arguing against those strawmen and instead spend our time more usefully mucking about in the grey in between. Extreme Position #1: We need to immediately end all use of hydrocarbons, and natural resources extraction in general. 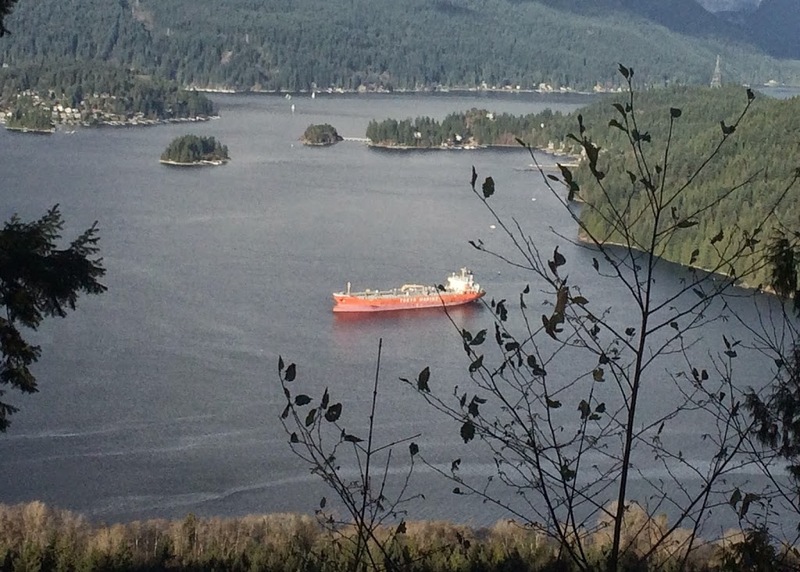 Extreme Position #2: Any act that curtails or slows Canada’s expansion of natural resource extraction and export using the current model will destroy our fragile economy. These arguments are both, unfortunately, commonly used in “opinions” expressed by such mainstream media as our local PostMedia Newspapers of Note(tm). The first may be held by a vanishingly small number of environmental activists, but it is implied in every social media (or other) comment that says (I paraphrase) “the protesters use nylon tents made from petroleum – therefore they are hypocrites”, or more subtly when one opines “the world needs oil, therefore we need to build this pipeline”. The second is the natural counterpoint to the first, and is commonly expressed, sometimes rather indirectly, by varied groups from the Dan Miller to the Fraser Institute. In social media comments, this manifests as something along the lines of “BC’s economy has always relied on resource extraction” (which is not the least bit apropos to this pipeline project, but I digress). I think (hope?) we can agree that these are the extreme outer points of the argument, and there is a world of grey where solutions will be found, and where the useful politics are. I see the middle ground as including a discussion of national goals are as far as energy and resource extraction, especially considering we only have one chance to take this stuff out of the ground and make money from it. We need to figure out how we are going to catch up to our major trading partners, the United Nations, the World Bank, etc. in our approach to Climate Change policy. We need to figure out what type of growth is sustainable, when the current pace is creating both labour shortages and ginormous profits, while corporate taxation hits an all-time low and basic services of government suffer for funding. I would even love for us to have a discussion about a national energy policy, just to find out if the approach taken by Norway, Iceland, or even the UAE, makes better long-term sense for the citizens of Canada than our current course. I suspect we would be well served to better isolate our economy from volatile hydrocarbon price shocks, and increase, not reduce, or energy sovereignty. I would also like to be confident that the long-term environmental consequences of these large and unprecedented projects are considered, that protections are in place where needed, and that the revenue generated by these project will fund these protections. These are not “extreme” ideas, but are instead rational approaches that should inform good governance. But it is hard to fit those in a tweet, and short of the very few longer-form examples of journalism still around in Canada (mostly easily dismissed as the ramblings of intellectual elitists), these discussions are hardly occurring in the public realm. God forbid anyone raise them during an election. Now, go back and read the two “extreme” arguments above, and ask yourself who is making those extreme claims? Note than one is being made by a small fringe of the environmental movement. The other is being made, today, by the government ruling Canada. You should be scared of both, but only one is a clear and imminent threat to good governance in this country. Or maybe I’m just beating on a strawman. UPDATE – There is nothing else to say about this long piece by one of our Province’s most unimaginative climate-change-denying industry apologists except to say it demonstrates clearly my point about the ubiquity of the silly “you need oil, therefore this pipeline” line of reasoning. Thanks Keith, I knew I could count on you to pull out a strawman and give it a good old fashioned thrashing! Posted on November 10, 2014 February 6, 2015 . by Patrick Johnstone. 1 Comment. I have always had that strangely-Canadian Generation X respectful detachment from Remembrance Day. I proudly wear a poppy, I go to a Cenotaph or Memorial on November 11th, I show respect to the women and men in full uniform, but I recognize I don’t know what is in their head, and I’m cautious to include myself in their personal experience. What I find most amazing about Canada at Remembrance Day is that these veterans and those we lost, fought and died overseas. Canada didn’t fight a revolution to become a free nation, and in almost 150 years of being a nation, we have never faced a serious threat of invasion (Fenian Raids notwithstanding). However, we have forged strong alliances with other nations across the border and across the oceans, and we have been quick to engage in the fight when we see our allies being attacked, their right to self-determination or the rights of their citizens being undermined. Sometimes because we knew we may be next if we didn’t take the fight to them, but more commonly because it was the right thing to do. Two World Wars, Korea, Cypress, Croatia, Rwanda, Afghanistan… the list is long of places Canadians went to protect people under threat, or simply to stand between belligerents while peaceful resolutions were sought. I try to understand these conflicts, and the sacrifices made by individuals for the greater cause, but it was never personal for me. I have an uncle who served in Vietnam and some more distant cousins with military careers, and when I lived in the Mid-West, I made friends with a few people who eventually got called up and served in Iraq and Afghanistan. Thankfully, they all got back alive and well. So I have been, through luck and happenstance, distanced from the real impacts of war. 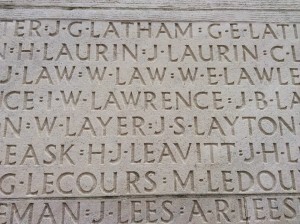 I never knew my Grandfathers, both died before I was born and I have very little knowledge about them. Writing this, it occurs to me I don’t even know their full names. It’s not that they were not mentioned in my household, but more that when I was growing up, my extended family was stretched all over Canada and the United States, so occasions to spend time together were limited, and talk of my Parent’s childhood was not a common subject around the house. I know both of my parents had difficult relationships with their fathers, but those are their stories to tell, not mine. I knew my Mom was born just after her sister, at the beginning of WW2, and that their brothers were born well after; the narrative in my family was that gap was the time when my grandfather “went off to war”. I also know he struggled in his later life with things that sound much like what we would currently attribute to PTSD, but I am too far removed from that reality to know what the story really is. What I never knew until this summer was his father’s fate. My parents spent some time in Europe this summer, their first time touring the continent, and my Mom sent us back this picture. 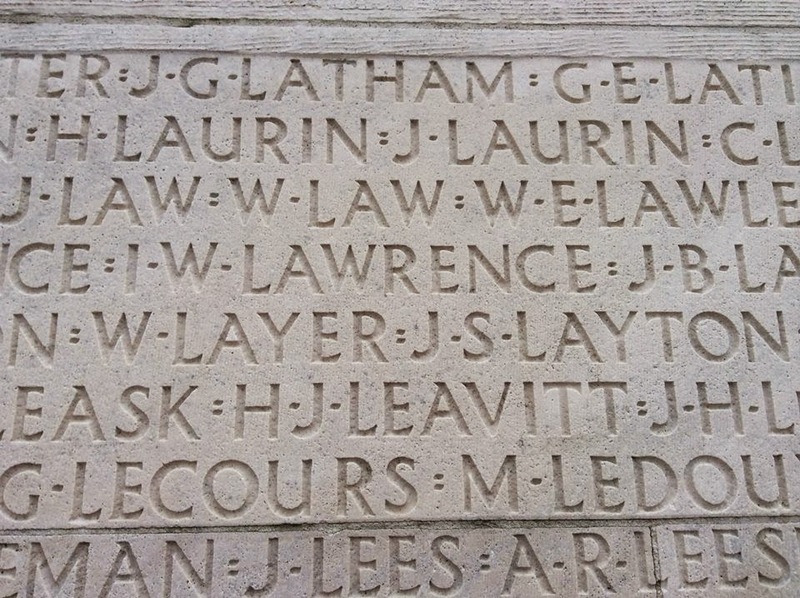 I now know my Great Grandfather was named Henry James Leavitt, he is one of the 11,285 people commemorated at the Vimy Memorial, and he never met his son who eventually went on to fight in the Artillery for the length of WW2, and came home changed. This year, on Remembrance Day, I will be thinking about those who served to bring the freedoms we enjoy as Canadians to people they didn’t know. I will think about people who came back changed, those who did not come back, and the families that love them. May they all find peace.